The veteran FFVII hero, BrutalAl, has performed yet another heroic deed. The field nobody had puzzled together before can now be seen in its fullness for the first time in over 17 years. EDIT: Unused Fields of FFVII article has now been updated with the image and with BrutalAl's notes. The direct rip can be divided into 6+1 groups of tiles, as is immediately visible. Group 7 (top right) is an obvious "foreground layer". First, I double checked if there were enough tiles in the six groups to fill a whole square without there remaining an uneven number of tiles at the end. 400 is a good number. It can create an image of 10*40, 16*25 or 20*20. This also means, with great likelihood, that the picture is completely without animations. Now to the actual "trick". The tiles in each group are NOT randomly mixed. 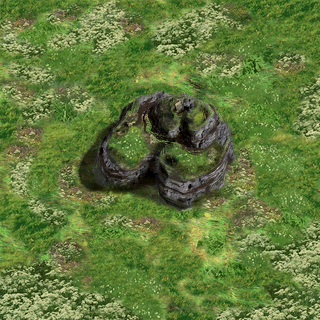 They are placed in an order that is used for the final field image/map. The tile at the top left in a group will always be used BEFORE the second tile on that row, the second tile will always be used before the third and so on in that group. This also means that the first tile in the final image must be Tile #1 either from group number 1, 2, 3, 4, 5 or 6. Let us say that Tile 4-01 (Group 4 Tile 01) is supposed to be at the top left in the final image. The tile to its right could yet again be one of six possible, either 1-01, 2-01, 3-01, 4-02, 5-01 or 6-01. Add to this I already knew that the row would end either on tile 10, 16, 20 or 25. Once the first row was completed the process became much easier, because then the "next" tile could always be matched with two other tiles (the one to the left and the one above). Despite this, it took three hours of active work to put together the TRAP puzzle. 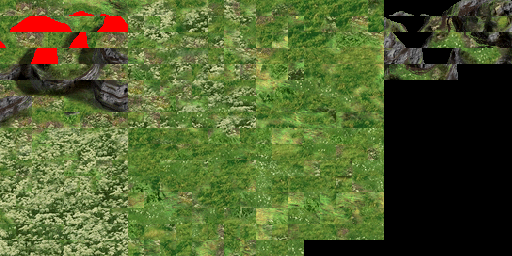 Naturally I let Photoshop "create" the numbered tile pieces for me, automatically. Otherwise this venture would have been very time consuming. HERO OF THE FFVII COMMUNITY! Hmm do you think this may have had something to do with Yuffie? kind of seems like where youd meet her. Read speculation segment about TRAP in my Unused Fields article. Start reading at "But what events were TRAP meant for?". It looks like there is a little cave entrance there! Looks like an extra dungeon like X-2's Tower. I'd say it would make a good trials dungeon, but they already have the arena. I think this was just a regular field map, so that rock formation probably wasn't any taller than Cloud. The width of this field is the minimum width (320px). So it will match up with the screen. Ergo, there would be no scrolling. Height-wise it is taller (the field is a square, so there could be vertical scrolling though there doesn't have to be). From the looks of it I would say it's a far away top-down shot. And yeah, I don't think it's a cave, not much taller than Cloud. There's nowhere on the World Map it matches up to. I'd say the best guess I've heard is that it was a chocobo catching screen, but I still think that's unlikely. What FFVII gems are yet to be revealed? I wonder if someone has gone over the other FF games with such a fine tooth comb, and found just-as-interesting stuff . Frontpage post made and Unused Fields of FFVII article updated. Perhaps it is an island that was meant to be placed somewhere around the midpoint of the Midgar Zolom marsh, and the game would force you to enter it for some reason (maybe the characters needed a break, or wanted to get to higher ground to see how far the marsh stretches on for) and some time after entering it, they would become trapped there by the Zolom. It could have scented them, or seen them when they climbed to a higher vantage point to see the rest of the marsh, and proceeded to encircle the island, forcing them to defeat it through a mandatory boss fight. i wonder what other mysteries wait to be uncovered in this game, among many other old RPGs...amazing that we're still finding stuff, like a recently discovered chest in The Legend of Dragoon that it 95% of players probably missed (it blew a lot of minds on the board recently. To those who've played LoD, ever found this? : https://www.youtube.com/watch?v=kvZaQQz1olo), and of course the new sidequest in FFIX. EDIT: Credit to JBedford128's post here for prompting a small update in the TRAP commentary, where I mention that TRAP would have had scrolling on the up-down axis when roamed in-game. I also added the reminder that, if TRAP was roamed, the player could partially hide behind the top and the sides of the rock formation, judging by the tiles with red in them.